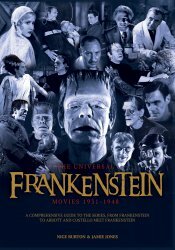 Direct to MyMovieMonsters.com from the creators of Classic Monsters of the Movies magazine in the United Kingdom: Universal Frankenstein Movies 1931-1948: We ship same or next day so don't wait for the UK! More pages than the standard guides, and it's perfect bound! Never was there such an iconic movie monster as Universal's Frankenstein Monster. Brought spectacularly to life by the combined visionary talents of director James Whale and makeup supremo Jack Pierce, this shambling, sympathetic brute, played to perfection by Boris Karloff, was destined to become the stuff of cinematic legend. The Universal Frankenstein Movies 1931-1948 celebrates this tour de force of monster movie franchises. 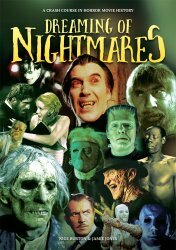 Classic Monsters looks in detail at each film in turn, chronicling the significance of each entry: Frankenstein (1931), Bride of Frankenstein (1935), Son of Frankenstein (1939), The Ghost of Frankenstein (1942), Frankenstein Meets the Wolf Man (1943), House of Frankenstein (1944), House of Dracula (1945) and Abbott and Costello Meet Frankenstein (1948). Through the vagaries of studio politics, decreasing budgets and some of the most incredible monster rallies ever committed to celluloid, this is a most remarkable story of the highs and lows of everyone's favorite monster. Painstakingly researched and lovingly written by authors Nige Burton and Jamie Jones, The Universal Frankenstein Movies 1931-1948 also looks in depth at the many people behind the series, from cast and crew to studio executives and the creative brains at the beating heart of the Frankenstein story. This luxurious 68-page special collector's edition magazine contains more pages than the regular Ultimate Guides and is perfect bound in the style of Classic Monsters of the Movies magazine. Packed with articles, stills and posters, all printed in a beautiful full color publication which any classic monster lover will cherish. Collectors Note: The publications produced by Stripey Media Ltd., including this special edition, have set a new standard for quality. The images posted to our website simply do not do these gems justice. All photos are crisp, pages are colorful, and even the covers on some of the guides feature spot varnish to make cover elements pop! These are a must for any monster magazine collection. While supplies last we also offer issues of Classic Monsters of the Movies magazine, additional Ultimate Guides, and The Monsters Day-By-Day Almanac.